Ah, yes. 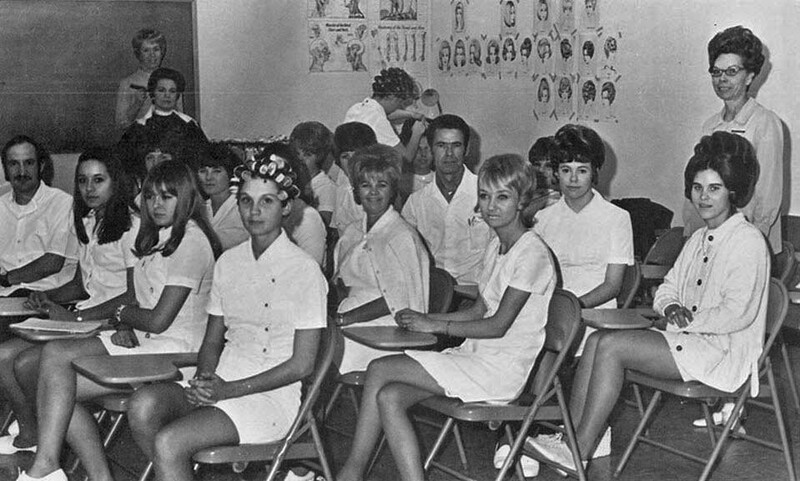 A class full of eager beauty school graduates ready to make their mark upon the world. 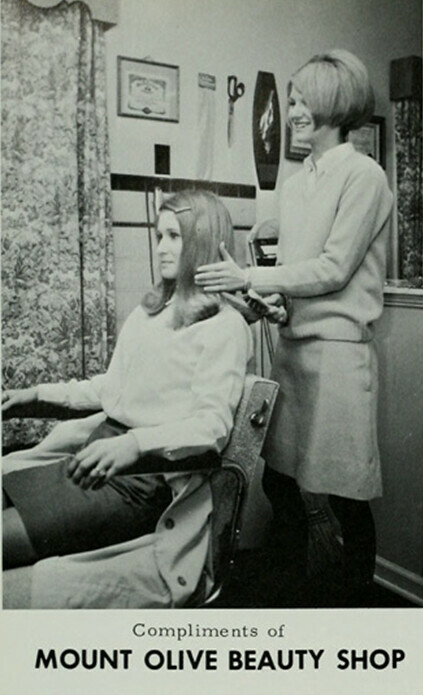 In the 1960's, the salon was the headquarters for the suburban mom; it was the gossip hub and bored housewife central. 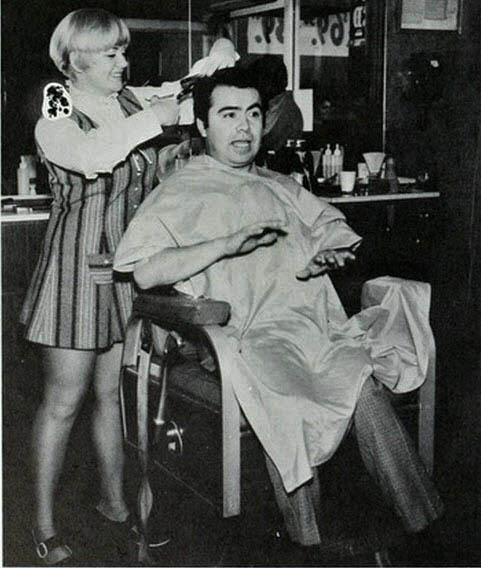 Women had to be well manicured and those sixties hairdos required a lot of tender loving care. By the 1980's, most women had gone to work, and the once bustling beauty salon had become deserted. 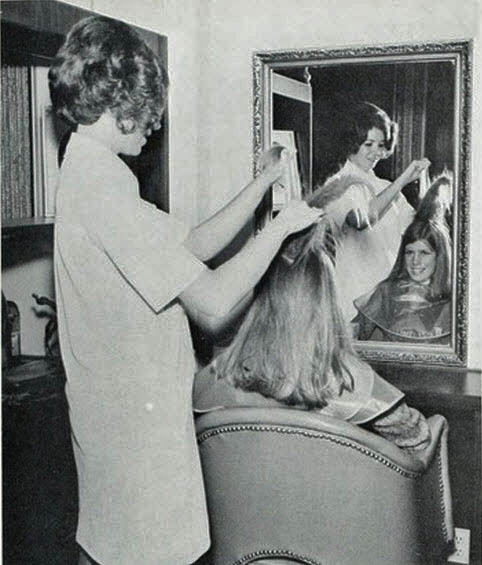 Women still needed their hair worked on, but the community aspect of it was no longer there. 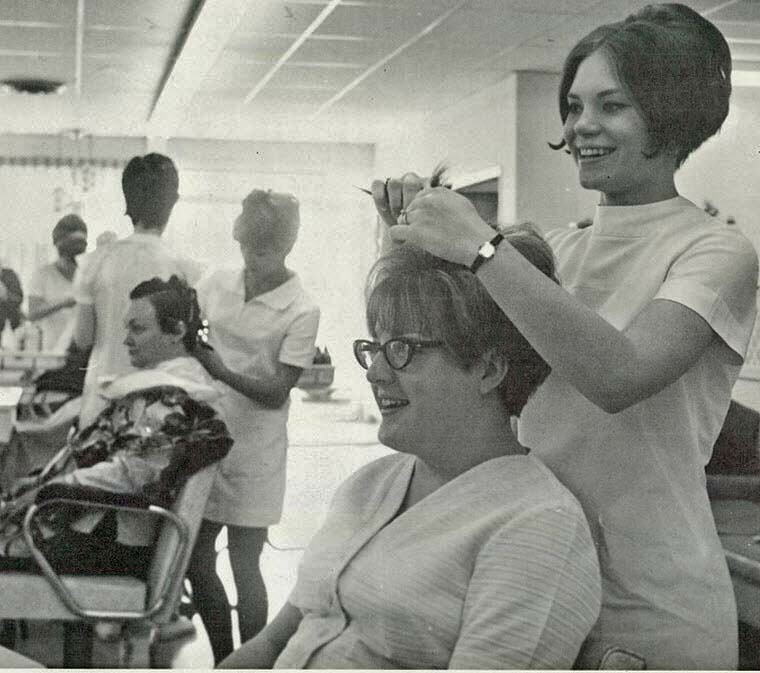 Many gave way to big name chains (a la Supercuts) or become high-end salons for the well-to-do. Either way, the beauty parlor wasn't what it used to be. The "Wal-Mart-ization" of America really hadn't taken hold yet, and so most establishments were still non-chain, mom & pop establishments. Thus, each hair cutting place had its own charm. 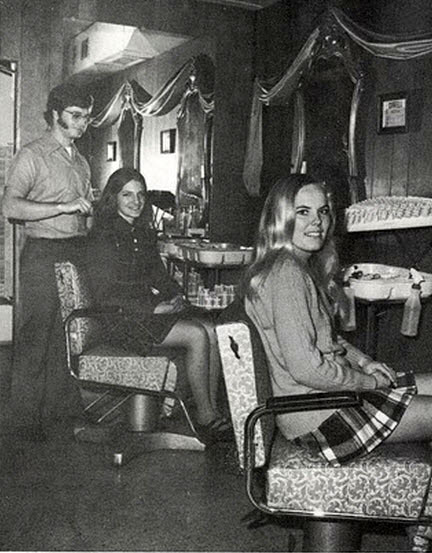 The one I went to was extremely dingy, with wood paneling, and the barber liked to blow the hair off everyone's neck. It was creepy, and he was probably a pervert..... but he was our pervert. 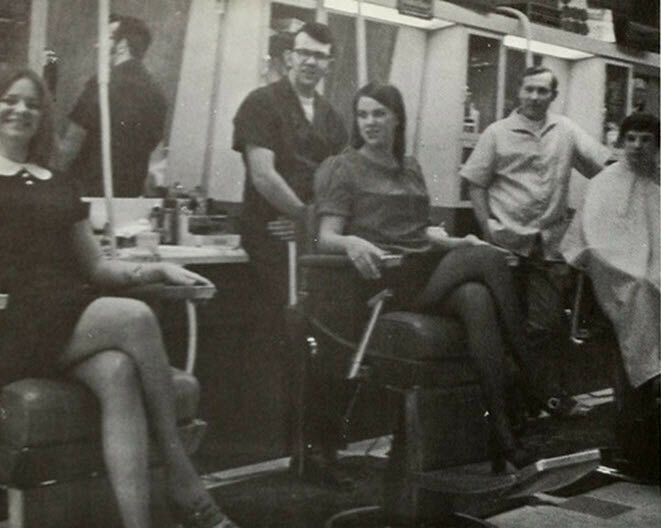 You can still find barbershops and hair salons today that are locally owned and staffed with friendly folks. However, the strip-mall chains outnumber them by far. Most hair salons are more or less like a fast food chain - your goal is to get in and out as quickly as possible, and on the cheap. And if I may whine and moan just a minute longer: I have to add that most of the hair stylists today haven't a clue what they're doing. I'm sure they're paid minimum wage, so you're not exactly going to get Vidal Sassoon at these places - but, damn, it does get frustrating. I've had my hair get f****d up beyond repair on more than one occasion. And don't get me started on the barbershop. This was truly a man's domain, full of ribald talk, nostril burning cologne, and even a straight razor shave. These places were once ubiquitous; the barbershop was a staple of the American life.... you'd have never dreamed it would go bye-bye. Now, when I go to a strip mall unisex hair salon, I feel like a fish out of water. Far from being a relaxing experience, it's a chore that I just want to get over with. Floyd the Barber and Meathead. 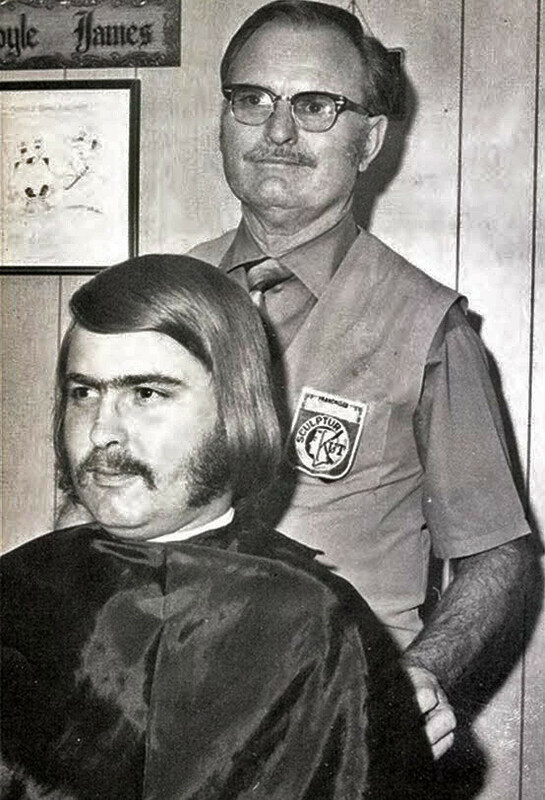 Man, I miss ye olde barbershop. I can still smell the Aqua Velva and cigarette smoke. Hard to believe it wasn't that long ago that we didn't have hand-held hair dryers. 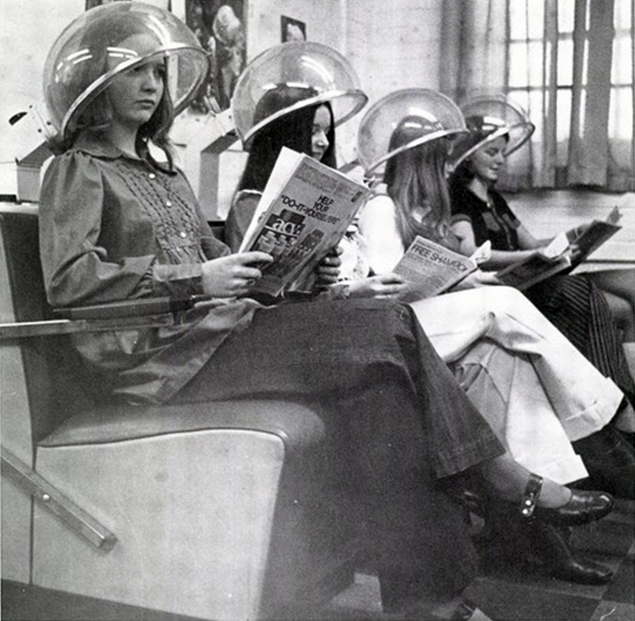 In fact, prior to the seventies, women would often only wash their hair once a week. 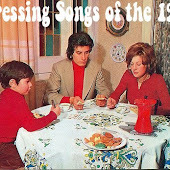 They'd go to the salon each week to have it washed, dried and set. 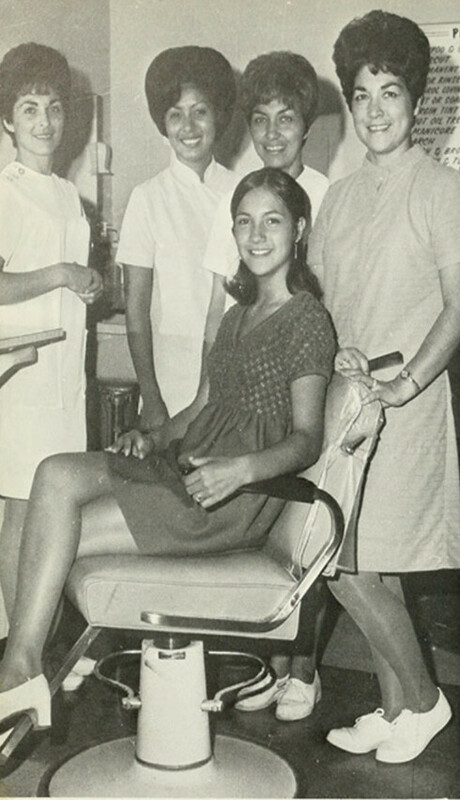 By the seventies, women grew their hair long and it needed much less maintenance. I can't recall where I found these next two photographs. There's something a bit melancholy about this empty beauty shop. America has moved on, but it lost something when it shut the doors of places like this. This would appear to be a "bouffant only" beauty salon, except for the chick who's actually getting her hair done. "Hey-hey-hey! Easy does it, babe. Leave something for my woman to run her fingers through." Enough exposed gam here for an unofficial "Mini Skirt Monday." 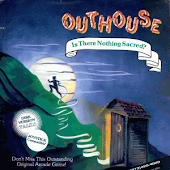 Wow, really brings back memories from my childhood. Reading about your perverted "hair blowing" barber made me chuckle a little, but seriously, that is creepy! On a recent visit to my Dad's place near Nashville, Tennessee, he had me take him to an old-fashioned barbershop! Only two chairs, and two barbers (who offered everything from a close shave, rinse, hair cut, you name it)! Mounted TVs blaring nothing but sports, an open door (literally-it was around 65 degrees that day)men waiting for their cuts, and, yes, all conversing about the latest gossip. Dad said they even keep odd hours, to accommodate third-shift workers who want a quick cut before going home after work at 6am! Only thing missing? Old comic books on the magazine table. You are correct that hand held dryers were not always around. 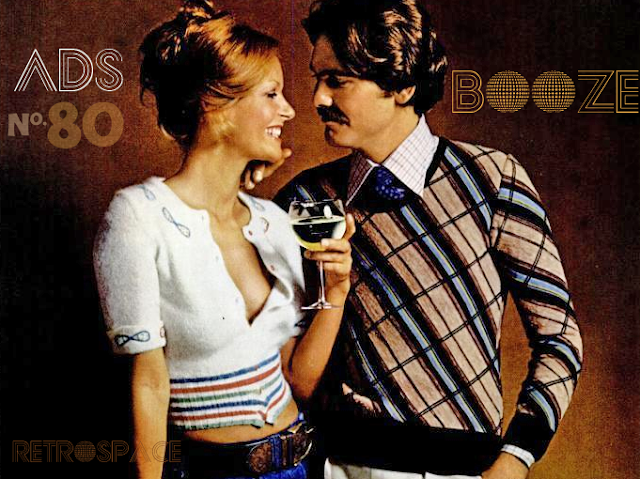 They were not a common household item until the mid 70s, just in time for the emerging disco era, hence the derogatory phrase "blow dried chest hair" to describe a disco male with ostentatious gold chains and shirt unbuttoned to the navel. 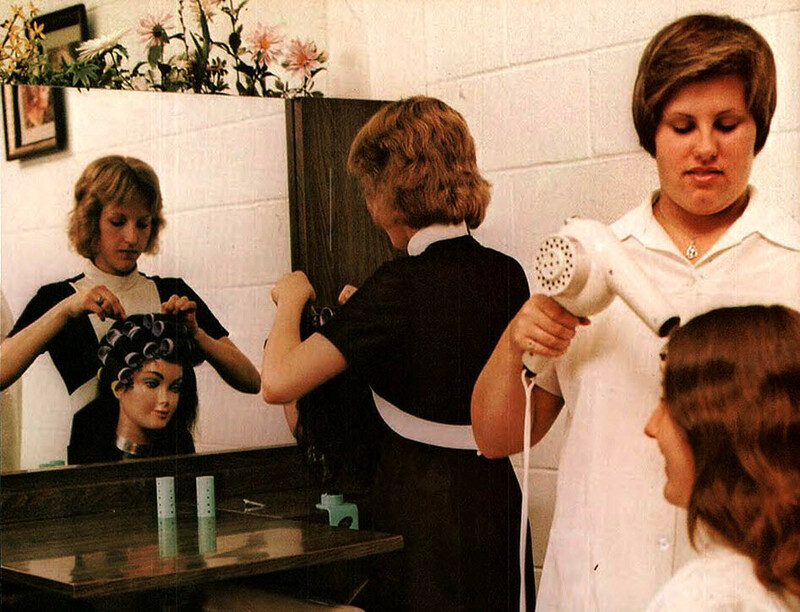 Remember those 1960s home hair dryers with the round plastic unit connected by a flexible tube to an elastic and plastic "bonnet" that resembled a shower cap? Everyone's mother had those back then. And if they were in a hurry they would dispense with the bonnet altogether and just hold the tubing up to their hair and let it blow out hot air like a primitive version of the blow dryer as we now know it. 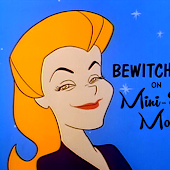 I spent many-a-Saturday morning (willingly) tagging along with my grandmother to her weekly "beauty parlor" appointment in the tiny neighboring town right on their main street. Lines of 60's-70's era space-age hair driers doubled in strength in front of the marbled mirrors like a menacing alien army that transported old ladies into old ladies with confident large hair-doos! It was very noisy, chemically stinky, but somehow comforting. I don't remember how I kept myself busy through the different processes she had to endure, but I do recall speaking shyly with the different regular customers and hair stylists. Perhaps I tried to help my grandmom solve her endless parade of Jumbles or crossword puzzles? I'm not certain. I do know my grandmom's beauty parlor is a distant memory for that town and many other towns as well. Even thought I cannot say I would ever be a customer at one of these gems (I go to a salon 4 times a year), I would give anything to spend another morning with my grandmom...waiting for her perm to process....helping her with 4 across. My Mom had her own shop for decades, starting in the laundry room/back porch of our old house, then in the laundry room of our new house, and then converted my brother's room into a proper shop with its own entrance (state law by then) after he moved out. Our whole house usually smelled like perm solution, and with our family room right outside both locations, I got a nose full. When her shop was in the new house's laundry room, there wasn't room for her dryer chair, so it was in the family room, which meant I usually had to clear out so some lady wouldn't have to watch Gilligan's Island or Emergency! after school. BTW, the dryer chair was a chaise style lounger upholstered in dark green marble-type not-quite-naugahyde plastic. It's still in our basement and I want it for our house. Sweet monobrow on the dude with the beard. CORRECTION to my lil' story: I was just in the aforementioned town the other day. Wow. The Beauty Spot still stands and is operational! I did not peek in but I could see it was a bit updated. Not too much though; they don't have a website! Phew. In the second photo of the empty retro beauty salon there is a manaquin wearing a plastic rain scarf. My grandma still wears one of these today. I'm trying to get some information about picture #4. I believe this is my mother sitting in the chair, it would have been taking in Detroit or Farmington, Michigan. 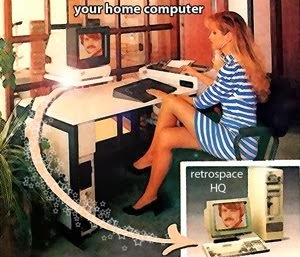 Can you give me any information about this picture?